Have you ever noticed those small aquariums that seem to have another world inside? 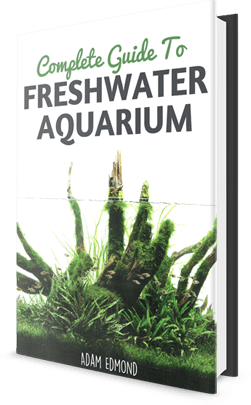 These Nano Aquariums is a fish-invertebrate community aquarium that is less than 20 gallons in capacity and can be the center of attention in any room. Due to their size, you can find them in any space and you will be surprised what a difference it can make for the ambiance of the room. For people who are passionate about aquariums and aquatic life, this can be a real challenge. The smaller the tank is the more difficult it will be to keep everything balanced. The slightest change in the temperature or chemical compounds of the water can destroy your project. It is a lot of work, but the satisfaction is worth it. 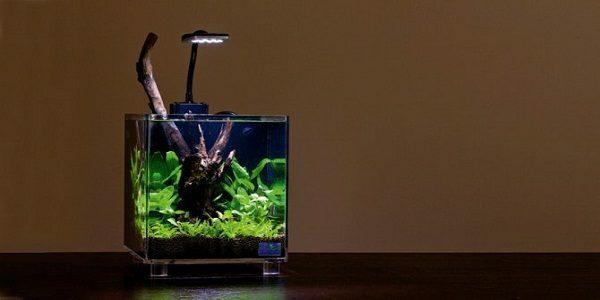 Once you have your first Nano Aquarium, you will be entirely dedicated to it. The general rules of maintenance are not much different than any regular aquarium, but there are some unique aspects that you need to take into consideration. The maintenance of this aquarium is similar to any other tank—it needs a filter, heater, and enough light, except that these need to be adapted to the volume of water. It can be tricky to find a filter that is so small, but still does the job; most of them either do not have enough power or the air stream is too powerful. The same thing applies for the heater; it is difficult to warm up a lot of water in a big aquarium. Do not forget to get a kit that will help you measure the nitrites from the water. Since it is such a small volume, if you change the water weekly or you add the wrong substrate, you can create a dangerous imbalance. At least every few days, you have to measure the levels of potassium and nitrates. To prevent any problems, do not change more than 20% of the volume of water weekly. Plants can make a Nano aquarium really spectacular. 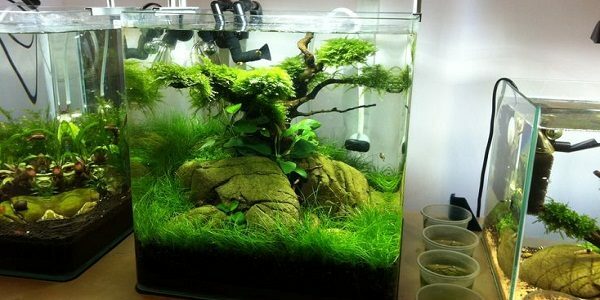 Many people believe that if the tank has only one or two plants, it will look bigger. This is entirely false. Actually, if you leave it almost empty, you emphasize its size. The secret is to place the plants on different levels. What you are looking for is to place taller plants in the background and the shortest ones in the front. Also, keep the middle of the tank clean, to get the illusion of bigger space. Also, the shape of the plant matters so the area does not look more crowded. What you are searching for are long plants, similar to normal grass. A good example is Eleocharis Parvula, which is perfect for a smaller tank and easy to maintain. For the front or middle of the tank you need the smallest plants that you can find to create a green “rug” on the substrate. Cryptocoryne wendtiiis one of the most common plants used for small tanks because it will not have more than 8-10 cm (3-4 inches) when it reaches maturity. In general, search for plants that do not have difficult requirements,are easy to grow, and are small in size. Here is where most people make a mistake. Just because a species of fish is generally small, it does not mean you should buy twenty and place them in the tank. Also, you have to know that most of the fish that are small are also viviparous, which means they will have many babies, very often. You should have no more than six small fish in your tank because you may wake up one month later with thirty. What is the moral of this? Take care what species you will bring. The size is not the only thing to consider. Of course you can, as long as you do it wisely. With fish, plants, and the equipment, the tank will already be crowded. Therefore, there is no space for big stones, castles, or whatever you would put in a big aquarium. The decorations that you use need to be small and placed on the sides of the tank. If you place decorations exactly in the middle of the tank, the tank will look smaller than it is. As you can see, to have a small aquarium is not so difficult. It is great for children that cannot take care of a bigger tank, or to use it as a decoration in your living room. Besides, once it is all settled and all the elements are balanced, you do not have to struggle to arrange it every time. The fish are small and they do not produce too much waste so a normal filter will clean everything without problems. Your main goal should be concentrating as much beauty as you can in that small space. You can play with textures and colors and create a spectacular universe. Use your imagination and take advantage of any amount of space. Nano Protein Skimmer: Why I need it?